HEy Mimo thats soo kwl! But i've seen your posts before when u said billybob sent you it. but then on other sights its got the exact same picture and they also said billyBob sent it to them!! :0 So i dont understand?!! MAybe one of your CPG mods can help?? Cool! I wish I knew Billybob! I have some great Club Penguin ideas and a comic series idea! i want that too :D thats awesome mimo ! Wow you are so lucky. A card from THE BILLYBOB! 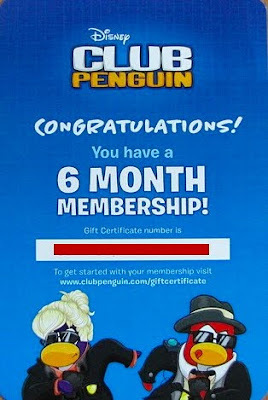 (Is it a real life card or postcard from CP) And you got a SIX month membership? Im so jelous hehe. how does he know you??? Hi Demphester, billybob sent lots of bloggers the card and membership, mimo is just one of them. Hope i helped! A comic series idea is not a bad idea. you should e-mail Club penguin fan mail, they might pass your idea on! Coolio! Did he like, send it to you in the mail? Awesome, it is! Talking like this, I like. I agree! What else is Mimo gonna get? That would be me! Billybob sent those sneak peeks to only a few ppl. Mimo just happened to be one of them! But Mimo is probably the only one who got this! Can Billybob do that for other people as well? And did it work? What if it was a prank! Now that would be funny!! I think it's a REAL LIFE card! WOAH awsome hey since you have the new ds game already can i have the code from the one billybob sent you? hey mimo maybe clubpenguin gave out those to every clubpenguin cheat sites!!!!!!!!!!!! !That would be cool if you get the game free if you have a clubpenguin cheats site. Yeahz! That's really cool! I want it too, even tho I already have it! When, Billybob sends things to the most popular blogs on the web, he does not just send it to Mimo. He normally sends them to everyone like that. If you see later posts, you see that before Herbert's Revenge and Veggie Villian, Billybob sent everyone different sneak peaks, they put them together and..........Success! the email with the spy phone is suppose to be what??? Well, billybob doesnt just send mimo stuff. he also sends them to some pretty big bloggers, too. Sorry for double-posting, but you are so lucky! You have two copies of the Elite Penguin Force Herbert's Revenge, (maybe you shou;ld have a contest and give one away!) a cool new black puffle, and a sixth month membership! You it for yourself! You deserve a chance, plsu buy all the puffles you can! When your membership expires, you will be left with nothing but your puffles! Can't wait to see your awesome new clothes! Cool but your already a member and you already have the game. 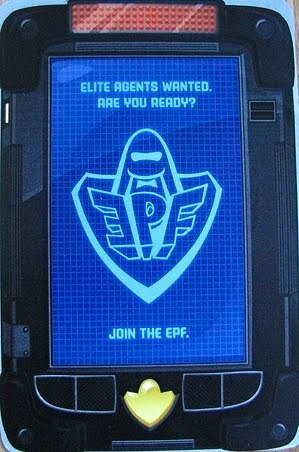 Can you have a contest for the EPF code? Just so all know, i will comment ocasionally. and i will not mod anymore. I would say email, actually. He checks this site! Alot! This is one of his favorites! Well, he has Mimo Q and A! So far he as four of them... I hope he makes more! I hope Mimo has a drawing for it! That would be really cool! No, he didn't. There are tons of CP blogs! But that would be SO cool! Please, not too many !!!. I do it all the time, but I'm a a hippocrate! We need cheats! So what they said! Wait... did you say next six months?! Why six months? Are you gonna kill him or something?! First of all, good job modding! Second of all, "hope this helps" is my old catch phrase! I used to say it before Waddle and Roll! Grrr.... jk! I don't care! Keep on modding! What email? You mean the one he posted about? THat is a membership card. If that's not what your talking aboutz, then I have no ideaz! He should have a draw to give it away! Or just one day say: I have figured out that I should give the game to awesomeness, Bobhead202! He is so awesome! Even tho he already has it, he deserves 1,000,000 copies! Lol, I wish. Seriously, he has all that! Geez Mimo... jk! But he should have a contest for it! hi everyone i saw hnwjanuary today she says hi! Haha! I know! Mimo has a secret admirer... LOL. Annnd WHAAA??? Why aren't you moding anymore? How could you do this? cool!! i wish i can have it! LOL joking.... good for ya mimo! If you have 2 codes from the DS game you should give one away! you should giveaway one of ur ds games and keep the member card to urself. It's sooooo cool! I'm jealous! p.s sorry i hvaent been modding ive been away at a school trip all week! Mimo the mod badge updaed. the Elite Penguin force spy phone has two new features coming soon. These have now been revealed on the page about the EPF spyphone. Elite Gear – Access to the most advanced Elite Agent equipment! Field-Ops – Be ready to report for duty! there is a red button on the side of the globe, and if you click it, a pair of glasses pop up, and if you click on them, you get them! I think this is why they kept mentioning glasses at the beginning of the mission. You are lucky Mimo I wish i got a 6 month membership and the game free. omg mimo ur so lucky! he sent u another membership LUCKY YOU!!! Billybob has sent Mimo cp memberships before, but this time cp sent it to other bloggers too. Hope this helped! Well send it to the Club Penguin times and they might post it! On the part of the Club Penguin ideas, its very hard for them to get them, but you can send them an e-mail! yay mimo is a member lol! Sup Stickers! Well who wouldn't be? lol! I wouldn't need it, coz my membership is 3 months late for expiring! Hey Demphster! You said "but then on other sights its got the exact same picture and they also said billyBob sent it to them!!" Who is "they" and "them"? Mimo gets sent lots of things from BillyBob for him to post on this website, and other people might get them too, but Billy bob sends it to Mimo before its announced publicly, if at all. Did you check the Mine? The tree has grown! My penguin is Kingicevar2. You should go check it out. hey are you going to use it for a contest or are you going to keep it? he couldve just sent u 30$ lol! So do I! He is really lucky! c00l! The first order from EPF! Hey, Mimo. Could you show us what the EPF room looked like before? You know, compare the new one and the old one? That's... unfair... But suppose we have Billybob to blame for that. If you already had the game and a membership, I think you have a contest or something. so i think in the epf room, it seems they are making an elevator. If you look at the small room. with an elevator that means it leads to somewhere...where do you think it will lead? OR do you think it's just a testing chamber? i play club penguin and i found billybob. They should make a toy that is like the new Spy Phone! That would be cool! how do you get to the elite penguin force HQ? I haven't seen her in a while! That's cool! Everyone wishes they were Mimo! Except for me, I wish I was a flaming koala bear. Pretty much all of us here do! Our defenses are securing the perimeter of the living room... FOR CPG! It says a message! Well, it always says a message, but this one is different! Your right! I wonder what they will do! I can't wait for either of them! No, Mimo got that! It was an edit, so he didn't get it at first, but he got it! He's a double member! Oh wait... Billybob sent him a membership before... a triple member! How many ppl are gonna say this?! I say again: So do I! Even tho I already have one! You're right! That'll probably be when the Water Party comes or when we get the new gadgets! Contest, I hope! The answer to your questions lie in your soul... Oh no, I'm becoming a hippie! AH!! The old EPF room was super cool! You could probably find it a few HUNDRED posts back! That's what I think too! He has both, so why does he need it? I hope he has a contest! It MAY be a testing chamber... I think it will lead to another base on the island! I found him today too! Where did you find him? I would play with that ALL day. I would use the puffle whistle the most! *uses puffle whistle and nothing happens* Why isn't it working! NO!! I have fallen victim to corporal business tricks! You gotta go to the Everyday Phoning Facility! Then you complete the test and go into the Command Room! You need to pass the test in the Everyday Phoning Facility. Good luck! thats not true mimo. you made this post as an excuse for the last post where people saw you had the mebership badge. nice try, but it is really hard to try to hide the fact that your a member. Yep mimo already has the game, now he has two! and im not sre about the membership lol! Lucky! Can you buy the card? That's awesome!... Never go on neopets...The chats are so mean. i just saw somthing really weird! Well, you could go to the ski village, then go into the Every Day Phoning Facility, or I just found the location from my mailbox, it said: Join the epf, then at the bottom right corner you click the box and it justs sends to to the place. Read Mimo's guide on how to pass it. Thats pretty fantubular... Yes I just made that up...three seconds flat man! Nope Mimo was not a member. He has when Billybob gives him one but thats pretty much it. I unlocked the elite puffle anf the official EPF costum. EPICNESS! click my name for a pic of meh wearing the stuff. ok you know how you can summon the elite puffle flare if you have bought a new cp ds game? when you dance, flare leaps thru hoops of flames. when you sit, flare sits and spits fire. when you wave, flare put his goggles on and gets engulfed in flames! mimo, if you use this on a post, please give me some reconition. Congrats. Flare's cool isn't he. Have you seen him weld when you sit? I like sitting next to metal objects with flare on so it looks as if he's welding it. Have fun! I know how to make a perfect score in the EPF test! 1.Throw snowball on the target. 2.Go to the green box then run to the red box. 3.Go behind the post where the red box is then throw snowball on camera 2. 4.Throw snowball on the powerbox. And thats it you'll get a perfect score! how is he so lucky? maybe it is mailed to him because he (like me) signed up and won a viking penguin? viking penguin winners, CHECK YOUR MAIL! you could have a 6 month membership inside your mailbox waiting for you!!! Hey mimo. The tree at the mine is growing even more. Hey why is Mimo soooooo quite? And oh yes When will the epf Hq be finished? omg! i clicked a not full server and it said it was full! A contest? With a free membership prize? That'll be awesome! A contest would be great! Yeah, a toy EPF gadget! If only there could be a real EPF gadget..you can teleport anywhere! lol..
Thanx Soo Much Dianac99! It makes soo much more sense now! You CPG Mods and Mimo are the greatest!!! I want a month membership free!!! I did too! BTW, nice pic! I like it! LOL! That is one reason they might have sent it! Yes it is! It's so awesome how Mimo gets memberships from him! LOL! That happens to me a lot! They are only 1 bar! Yooo Mimo congrats...But i have a question is it just you or do other people get 6 months? Billybob sent it to him, along with the new DS game Herbert's Revenge! Pretty sweet huh? Waddle On! Lol! Cool. Maybe I should try typing with my nose! *Types with nose* I really typed that with my nose... Not joking! Lol! Waddle On! I believe the kids with big Club Penguin cheat sights did. I saw a video that showed the unboxing of the same thing Mimo got. A six month membership and a Herbert's Revenge DS game. The video was made by Lux1200 who has a club penguin cheat sight. Waddle On! It will probably be finished by Friday. Thats when things are usually done but because the're launching things early now maybe Thursday. Keep checking! Waddle On! No, the reason he got it is because he has a major Club Penguin cheat sight. Others who have a major Club Penguin cheat sight got the same thing. And he didn't win a viking penguin. It was on a post a while ago. Back in 2008. Waddle On! Thats because he doesn't want anyone to know the code before he can get a chance to use it. Club Penguin codes can only be used once and only once. They can never be used again. Waddle On! The M on the top right screen on Club Penguin? Yea, I noticed that too about a week ago. I guess thats because the PSA doesn't exist anymore. So instead the're showing what to do when your an EPF agent. Thats just my theory. Waddle On! Why don't you use the membership Mimo? cool mimo please post this "at club penguin me and my friends swim and swin a hundreds of miles if we are lucky we get penguin slush's Its cold as ice are feet ARe Relaxed My Friend pufflefan999 some times joins "
you know billybob? thats so cool!